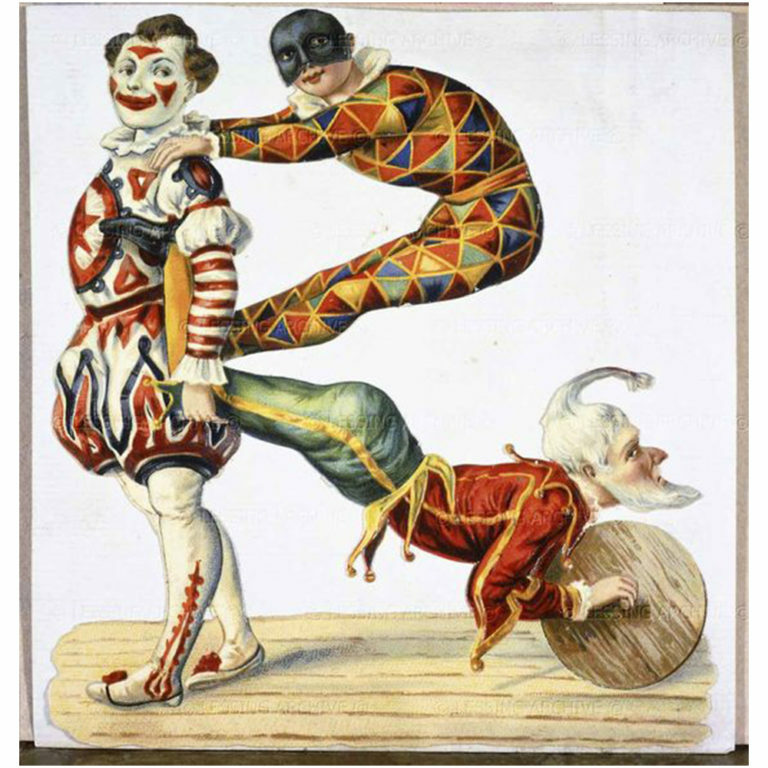 A visit to the circus during the Holidays is not complete without the antics of the clown but they were around centuries before the big top was invented. 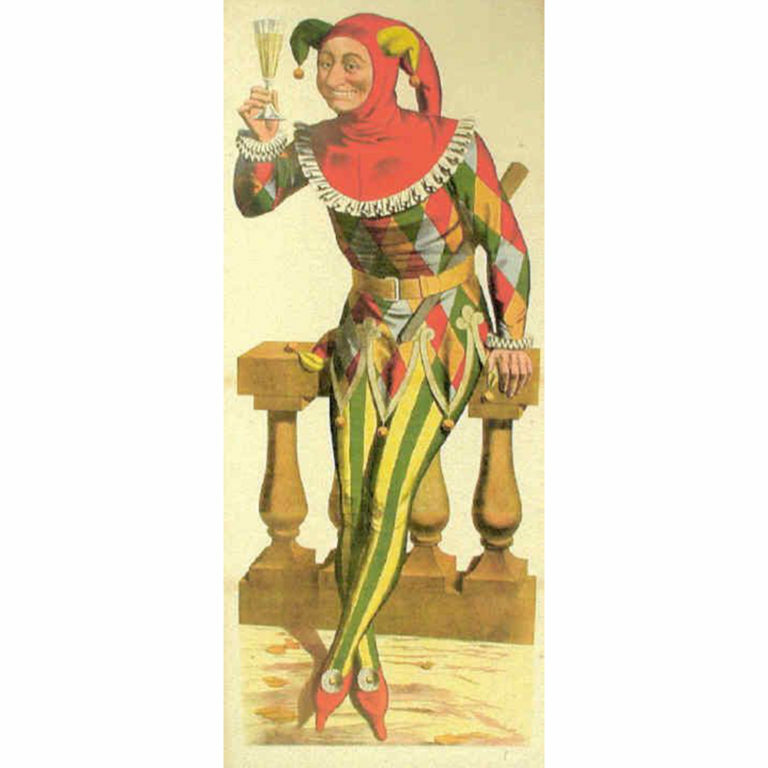 The earliest English clowns were called fools, Jack Puddings or Merry Andrews as the term clown, meaning clumsy did not enter the language until the 16th century. 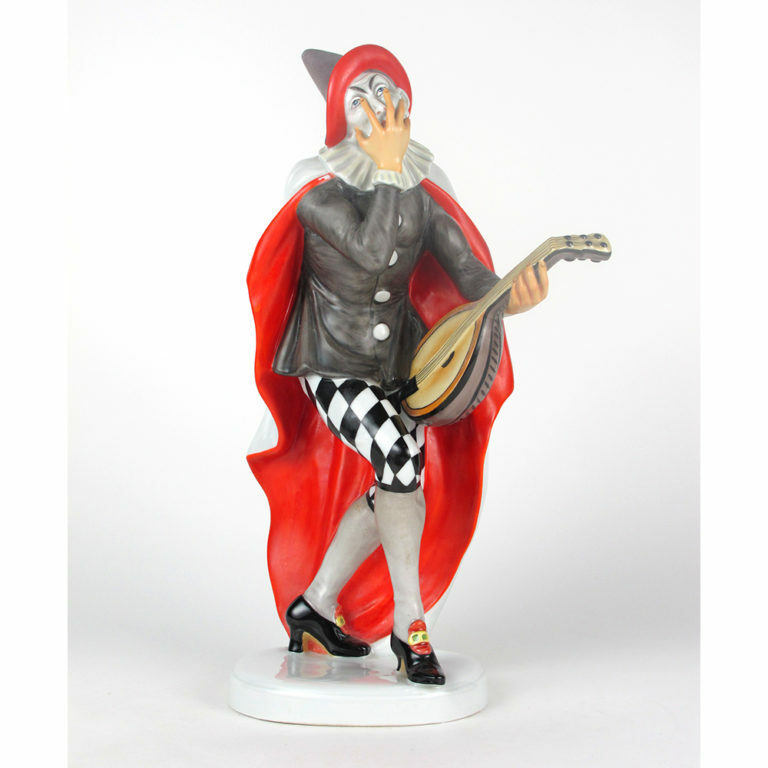 The Italian Commedia dell’arte performances helped form the characteristics of the modern clown by introducing the clumsy Pulchinello better known today as Mr. Punch, Arlechino the practical joker, and the rascally Pedrolino or Pierrot. 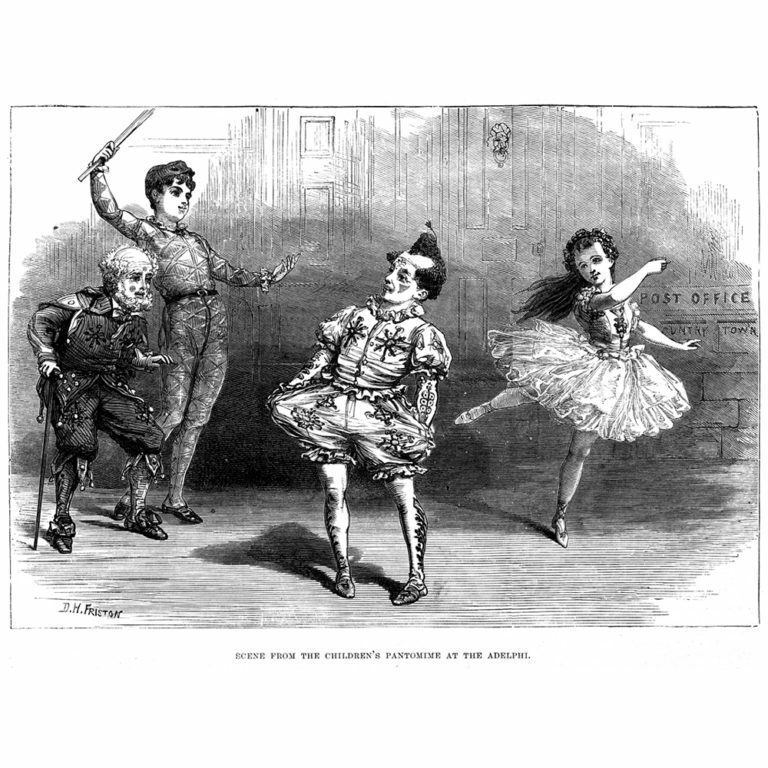 All these characters appeared on the English stage in Harlequinades or pantomimes during the 18th century. 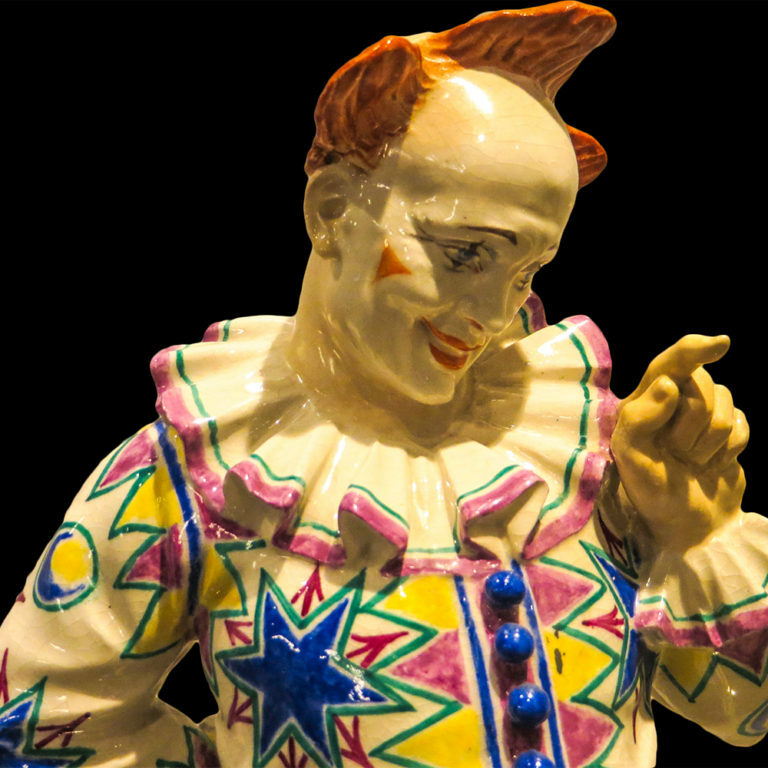 In the early 1800s the great Joseph Grimaldi began to steal the limelight and a new style of clown was born. 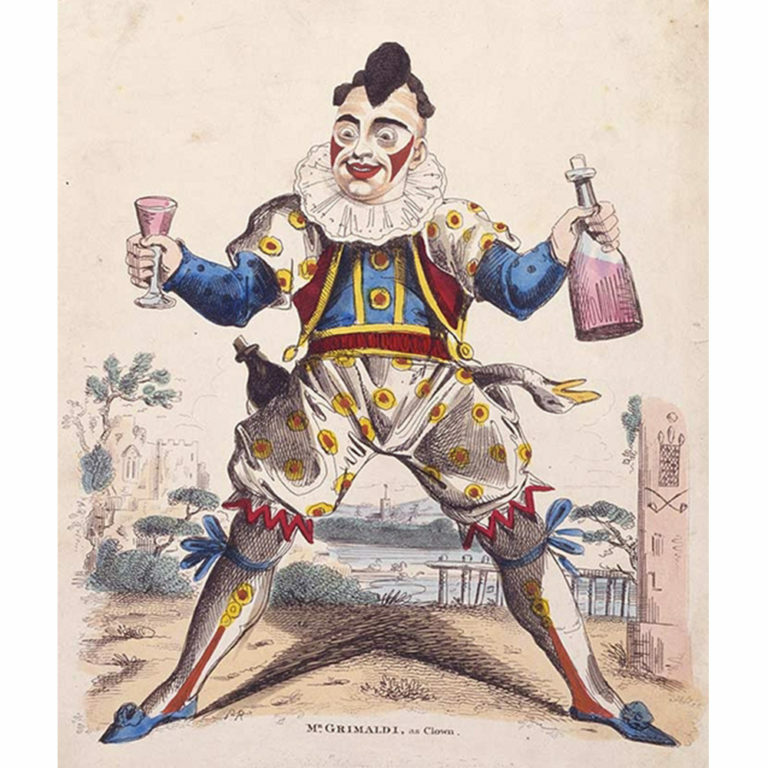 With his brightly painted face and baggy clothes adorned with spots and stripes, Grimaldi amazed his audiences with this comic genius and dynamic energy. 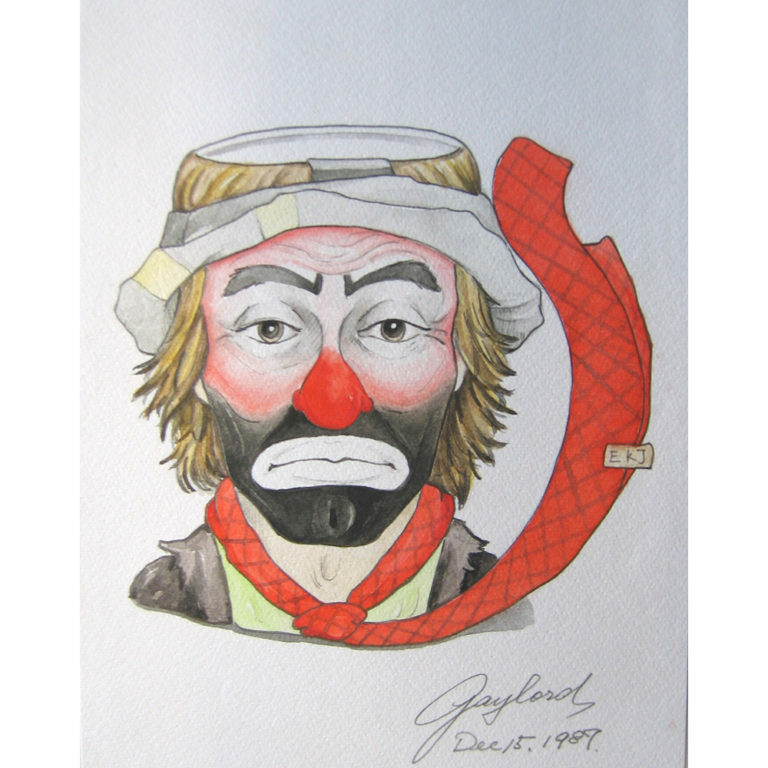 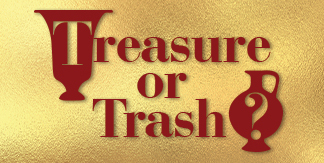 Many of his tricks still feature in the repertoire of the modern circus clown who are called Joey in his honor. 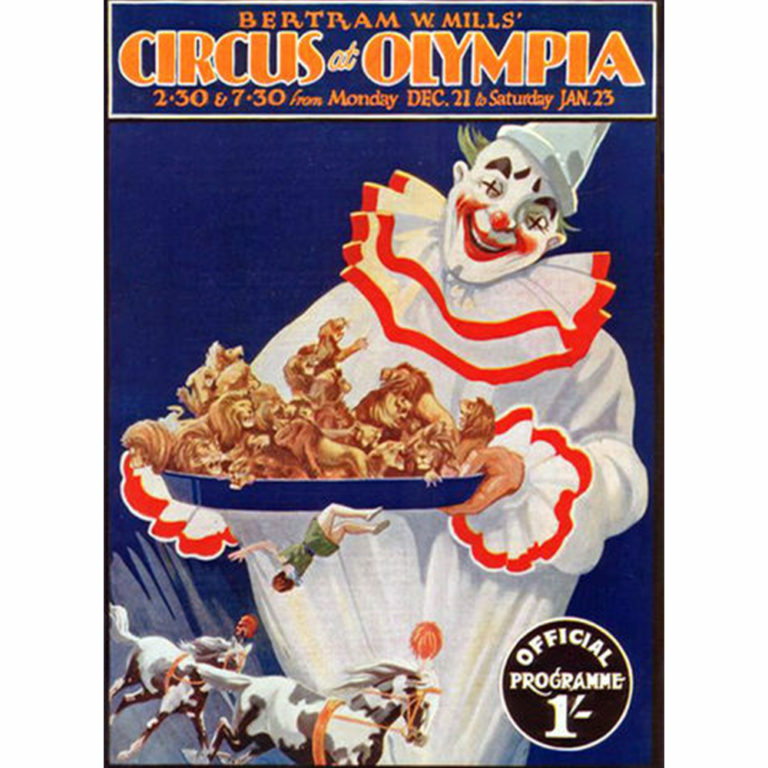 The circus developed from the equestrian displays of Philip Astley in the 1760s which took place in an arena with a stage for music and pantomime. 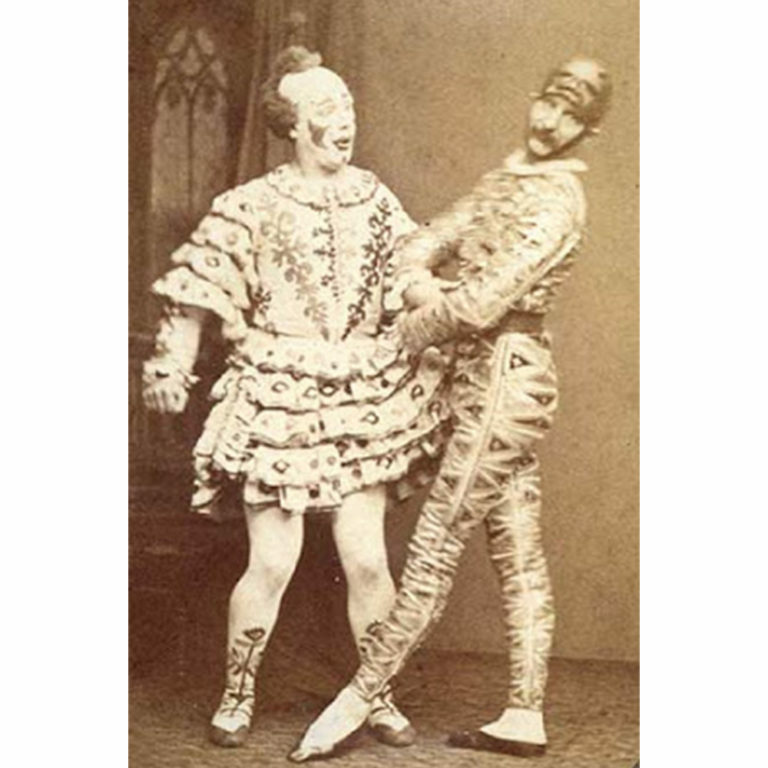 Similar shows sprang up in Europe and America, often in tents touring in caravans, and clown performances became a feature of the interludes. 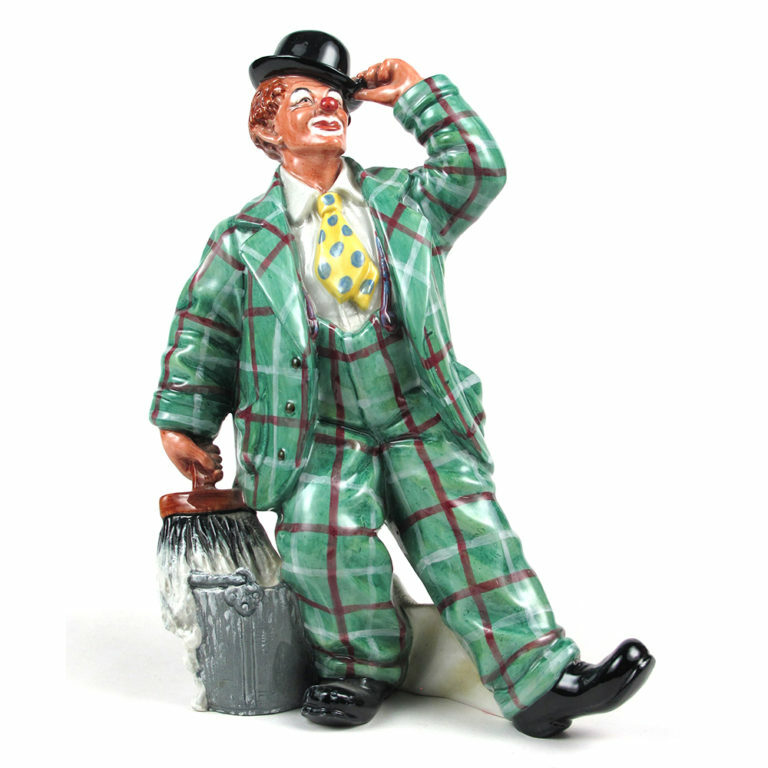 The circus clown needs to be as good as, if not better than, the serious artists in all their skills in order to parody them. 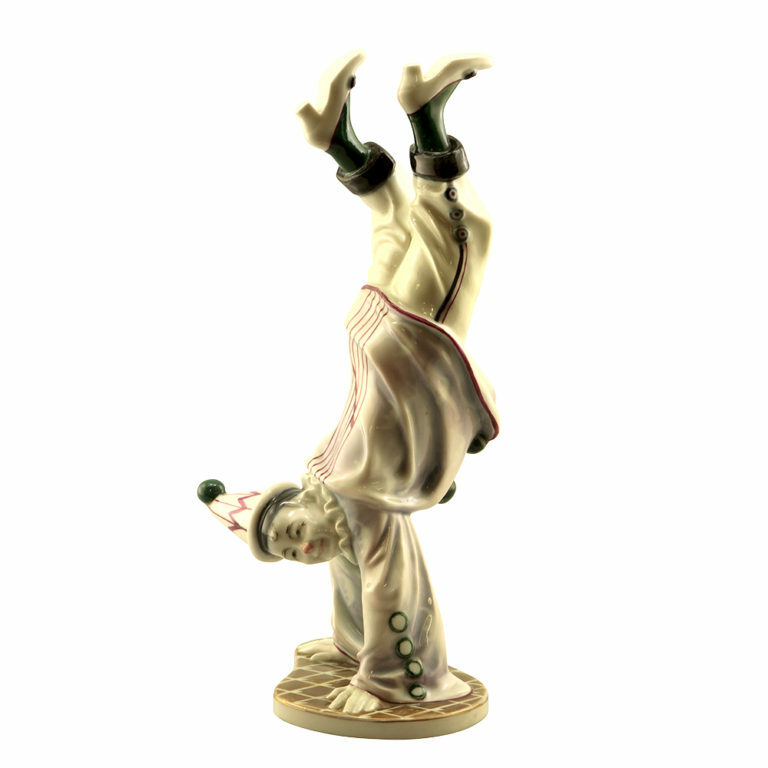 Typically, he trains as an acrobat from an early age. 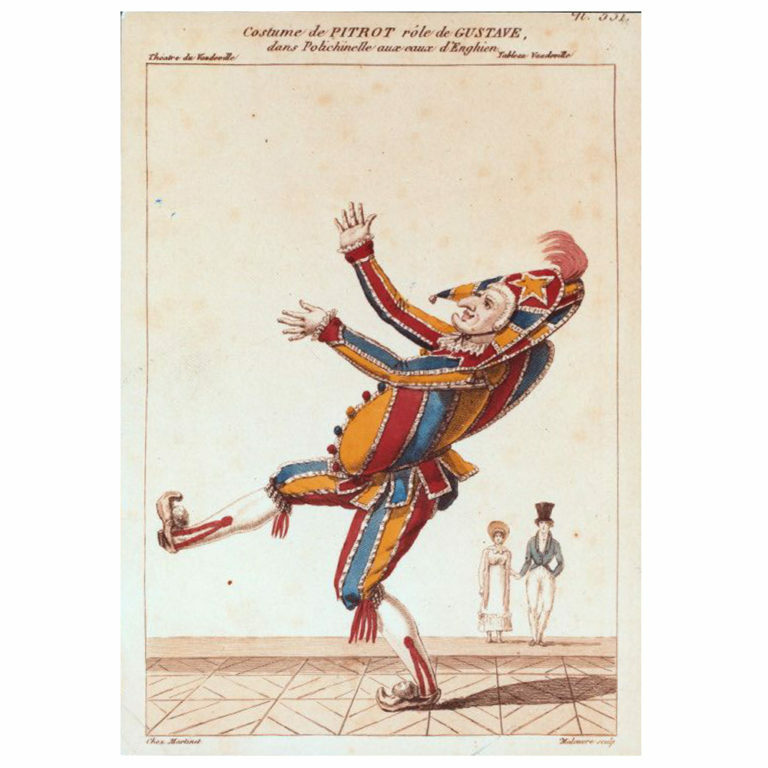 The clumsy, ridiculous auguste clown with his oversized suit and enormous shoes is said to have been the invention of Tom Belling, an acrobat and musical clown in Berlin. 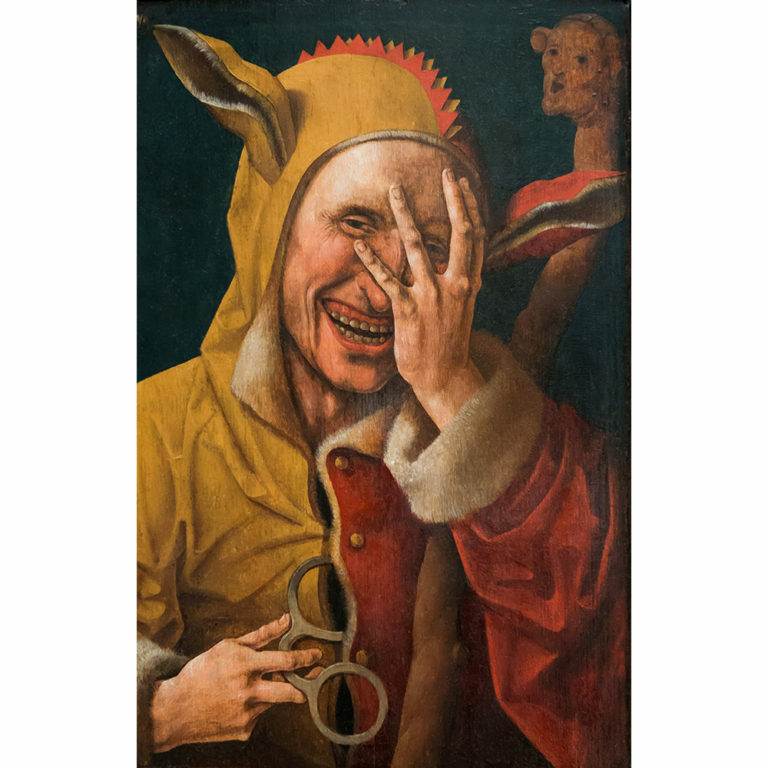 His antics had the crowd roaring “auguste” meaning idiot. 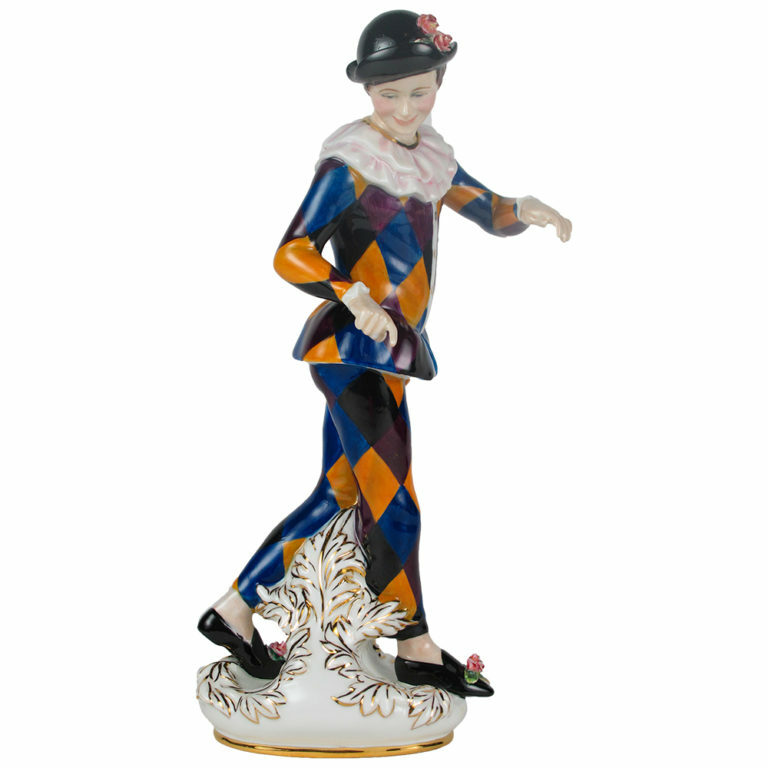 The auguste usually works alongside a witty and elegant white clown, whose costume with ruff and pom-poms is reminiscent of Pierrot. 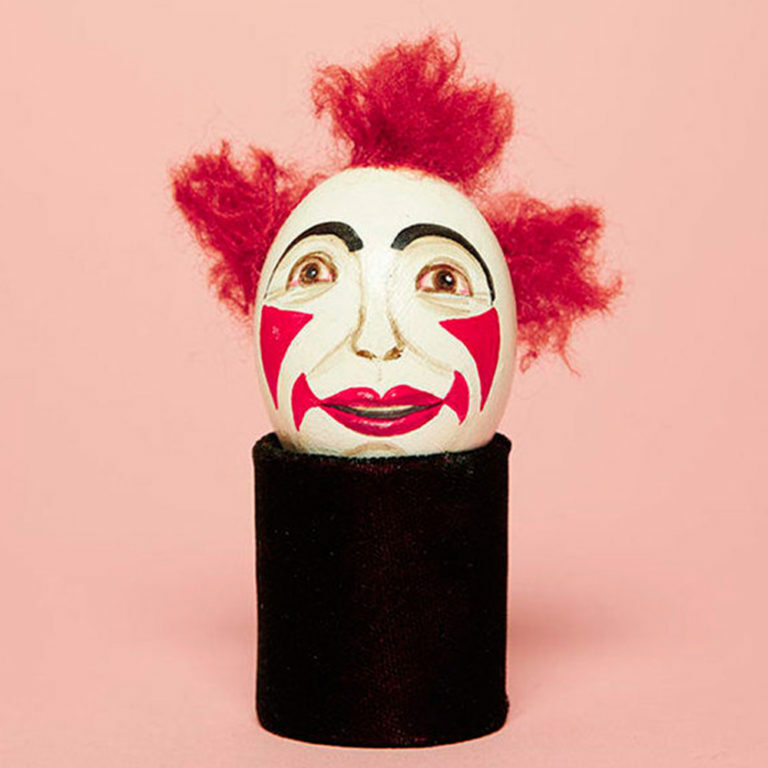 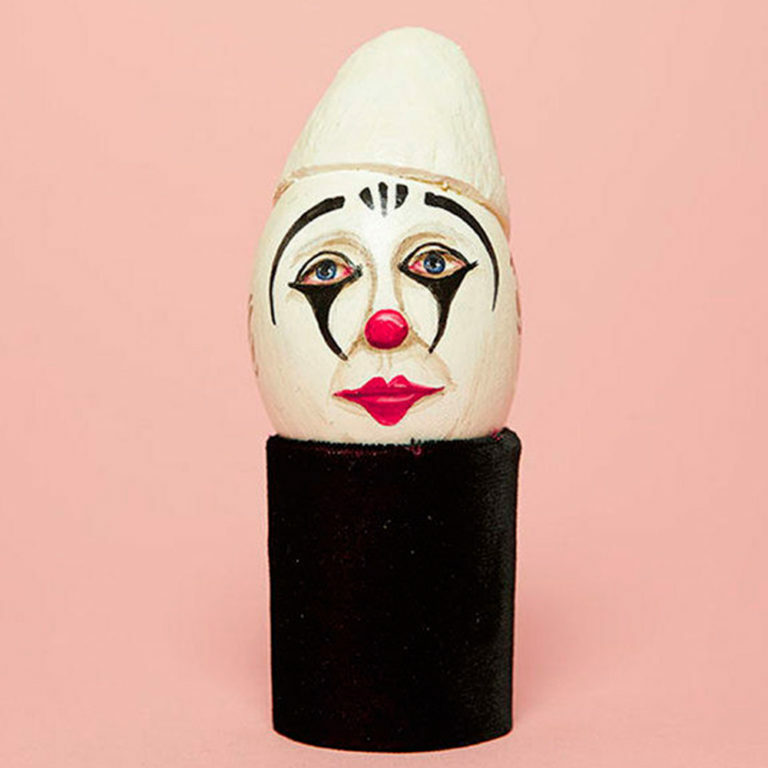 Every clown’s make-up is unique and in the days before photography a register of clown’s faces was painted on eggshells. 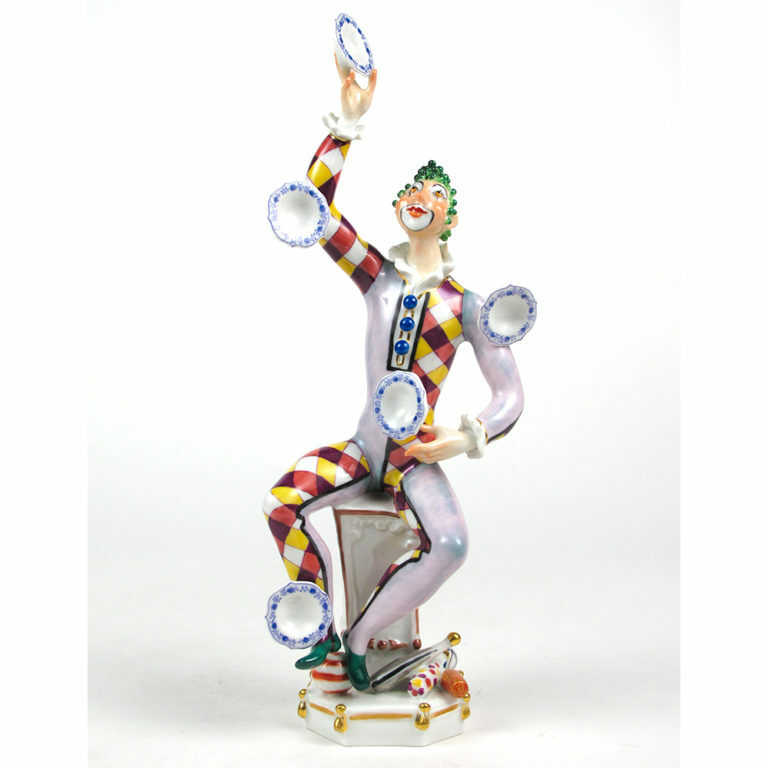 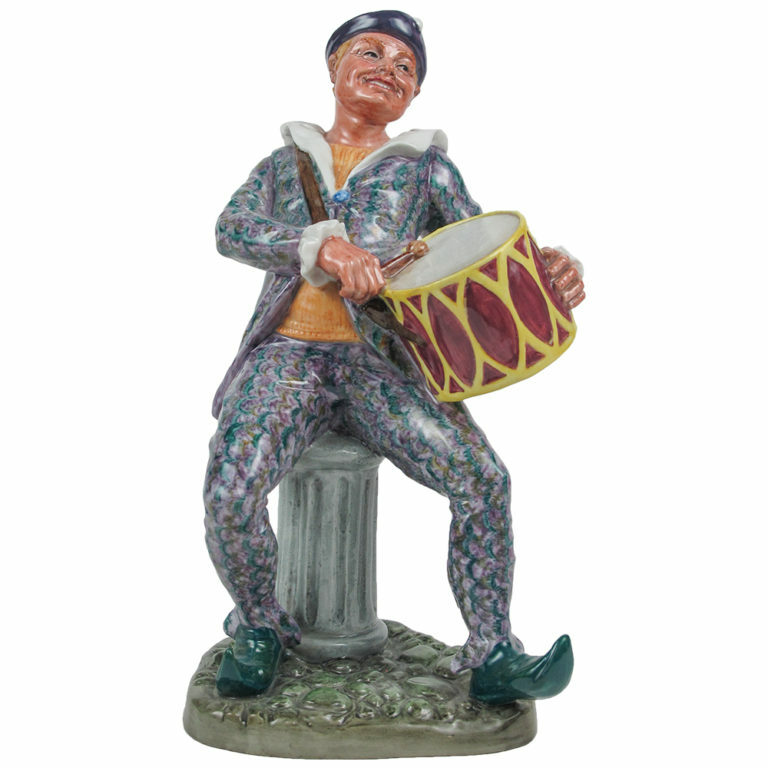 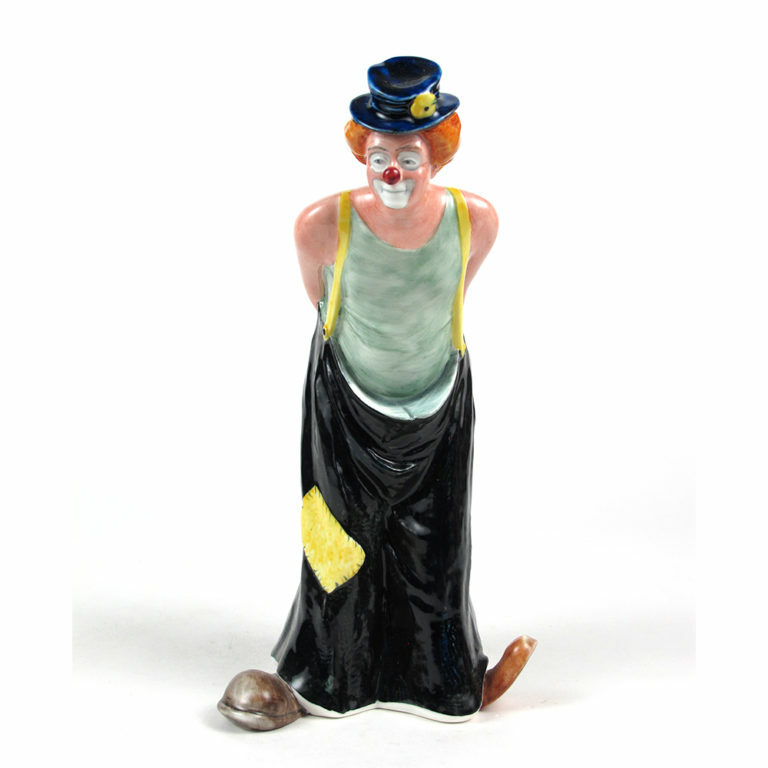 Royal Doulton artists have reveled in portraying clowns through the ages as can be seen in our Carnival & Cabaret exhibition. 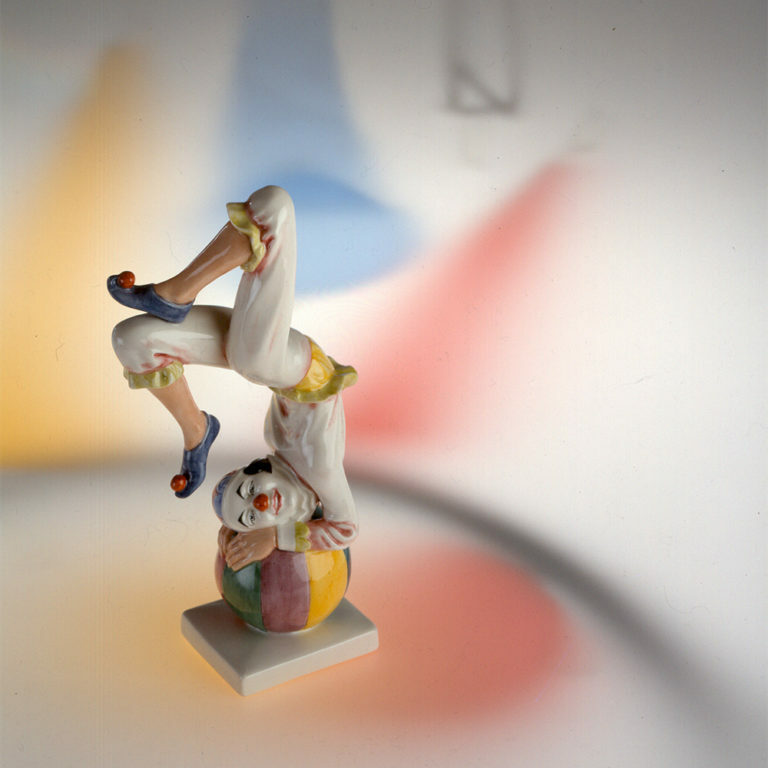 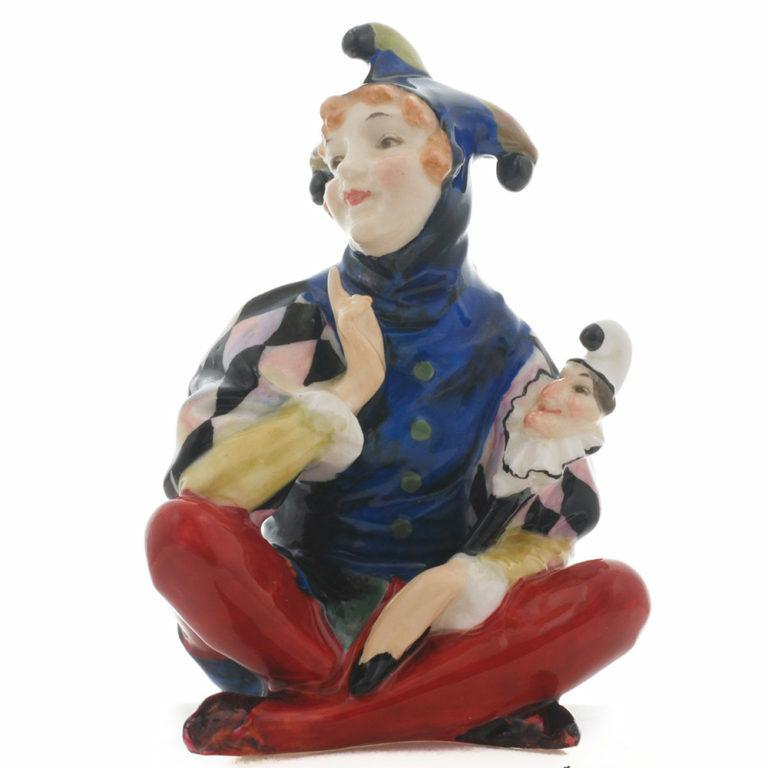 As well as figures of jesters and pierrots from the 1890s, the Wiener collection includes many rare prototypes and color trials of circus clowns which are on display at WMODA. 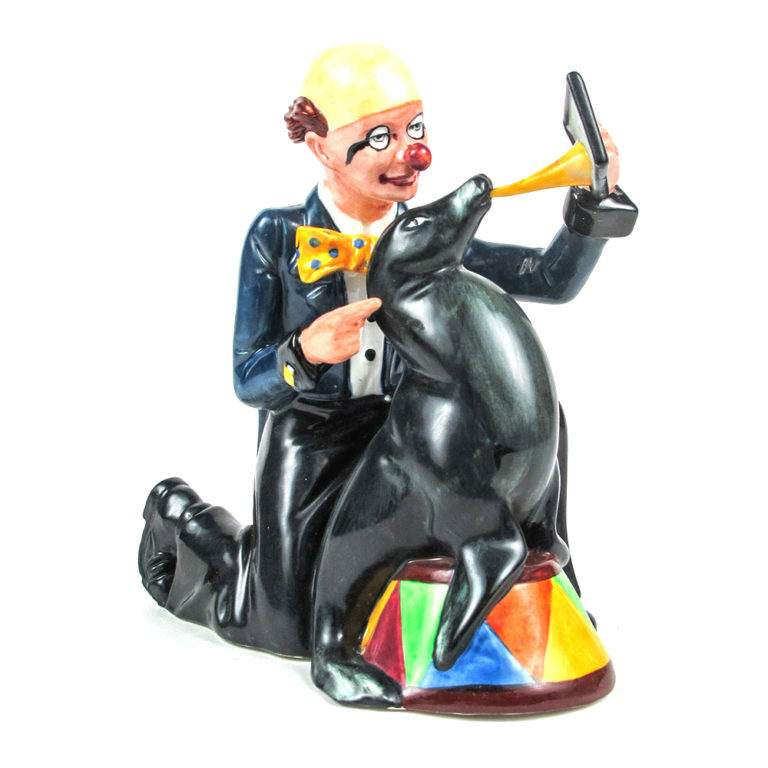 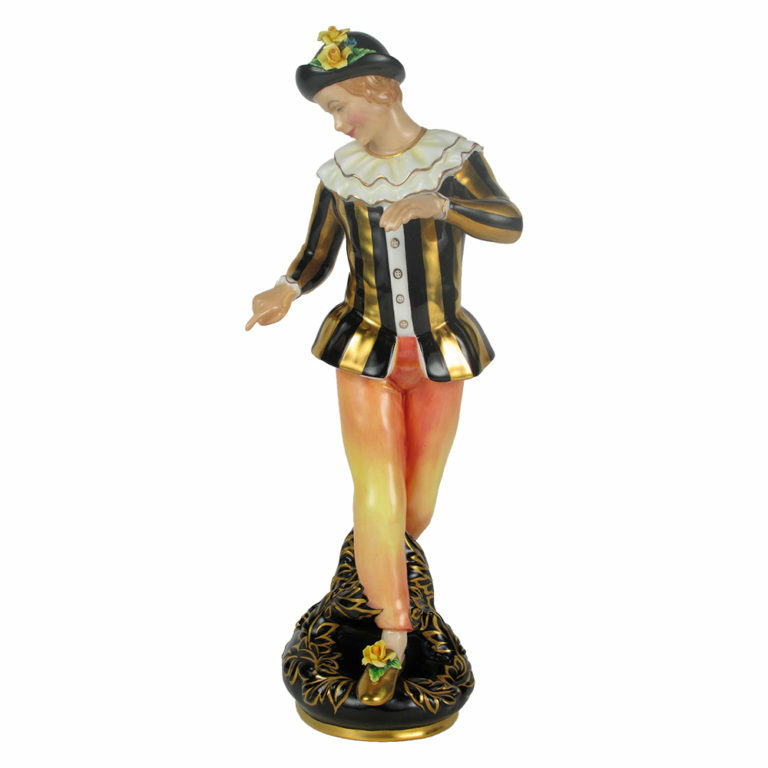 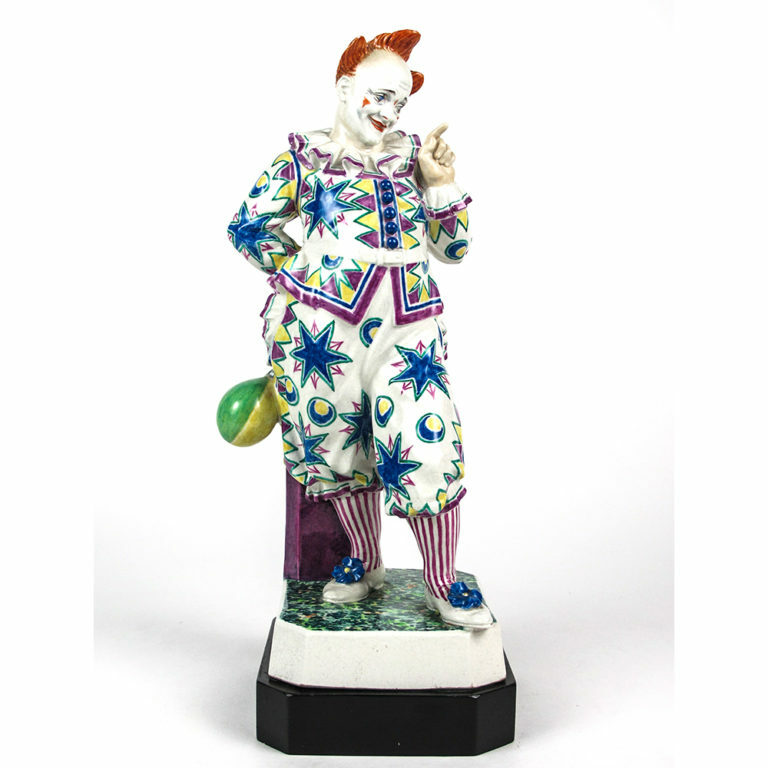 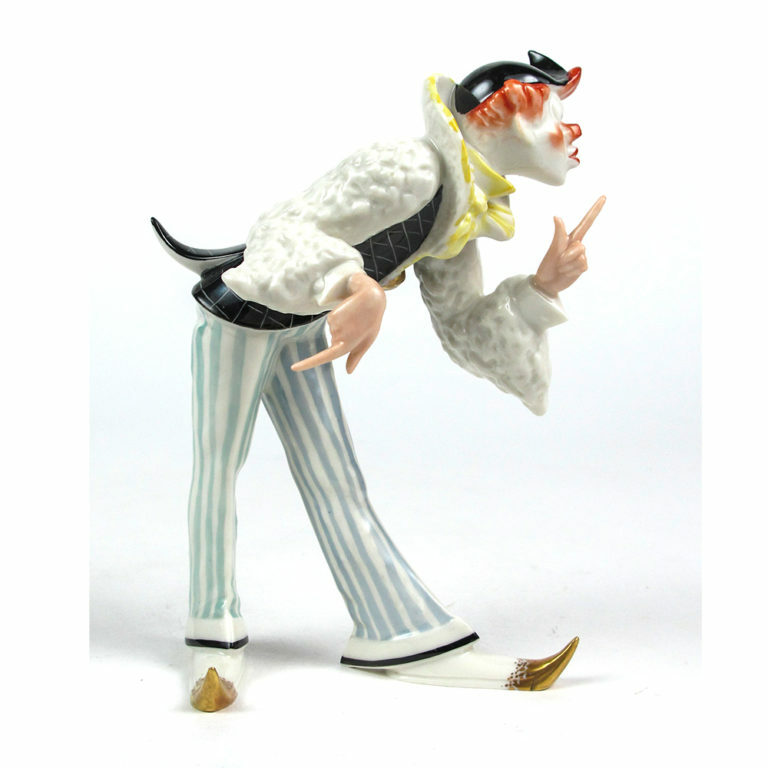 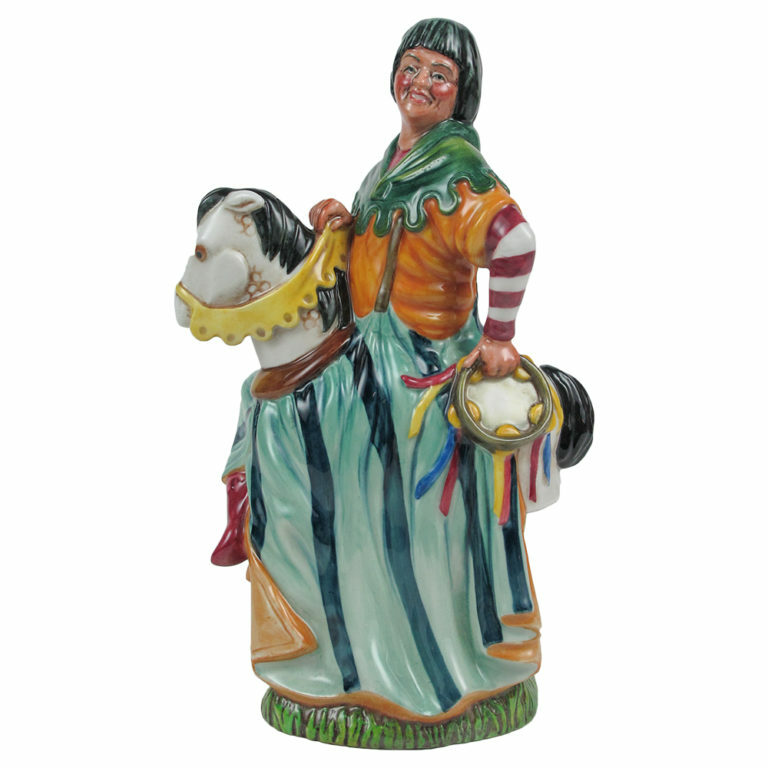 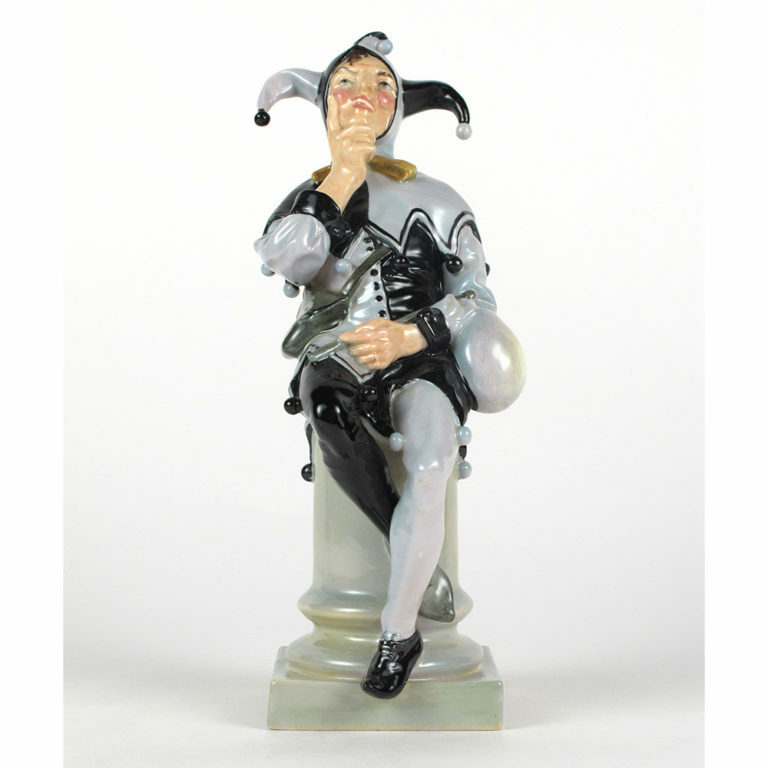 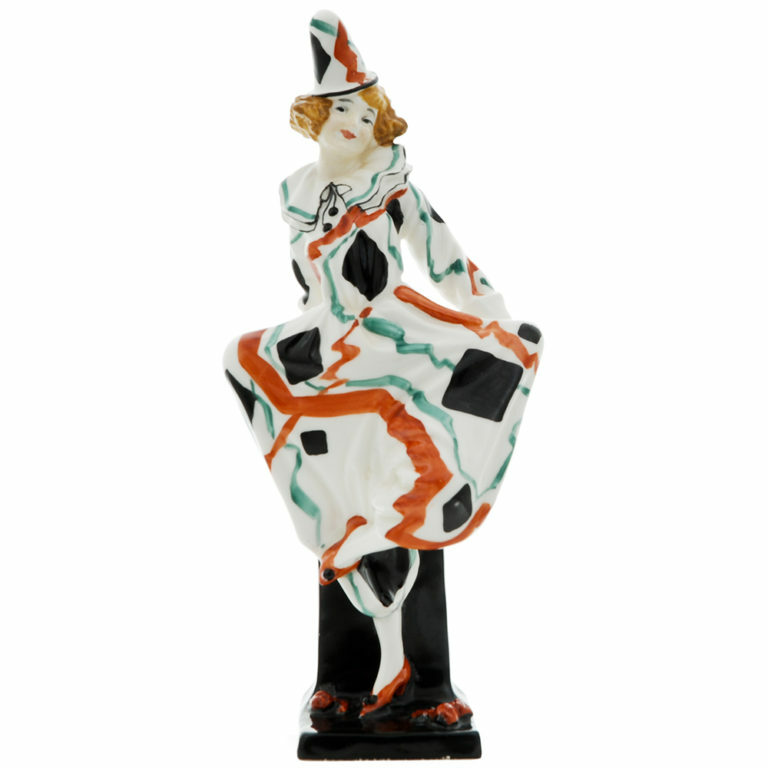 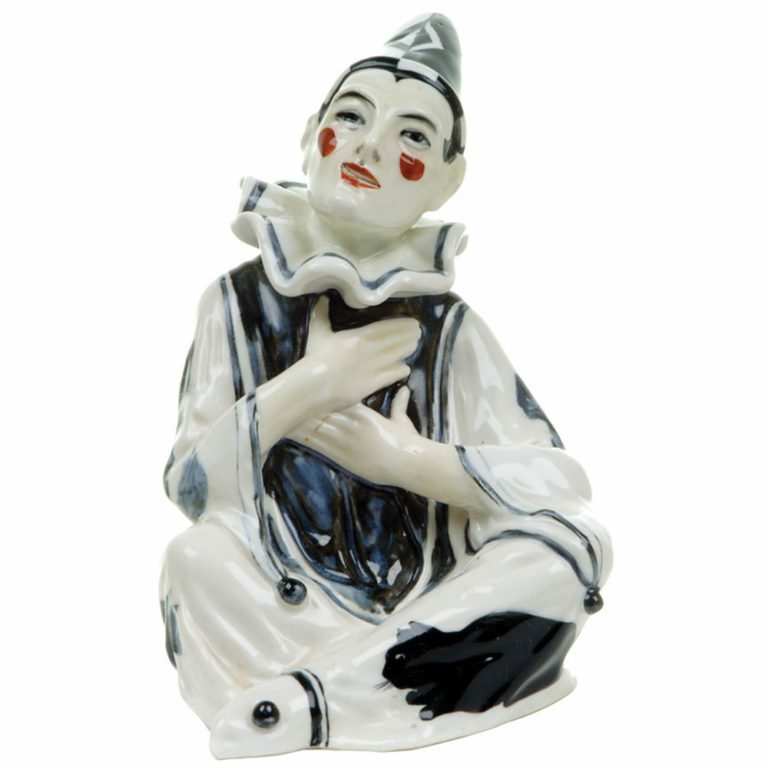 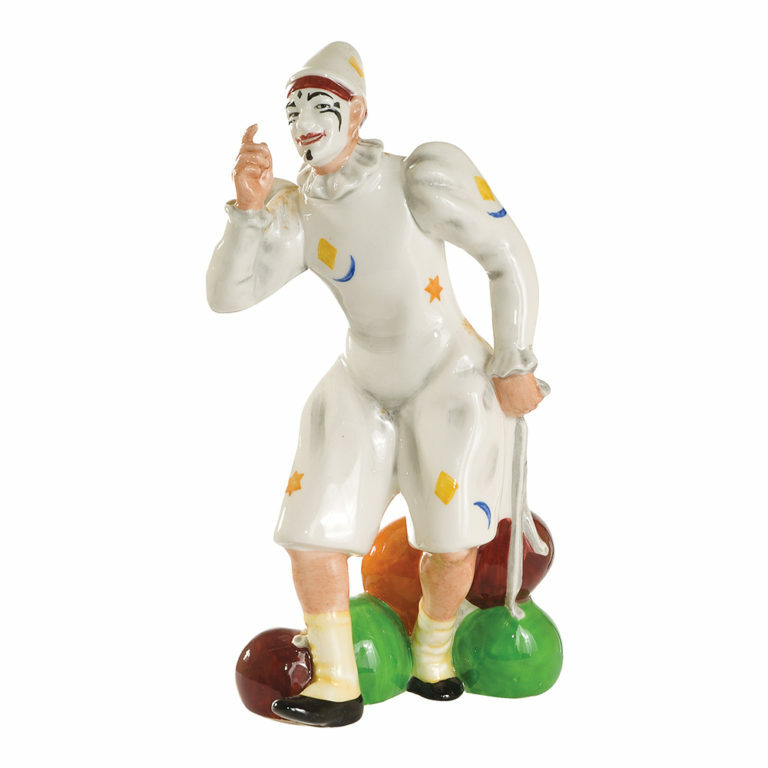 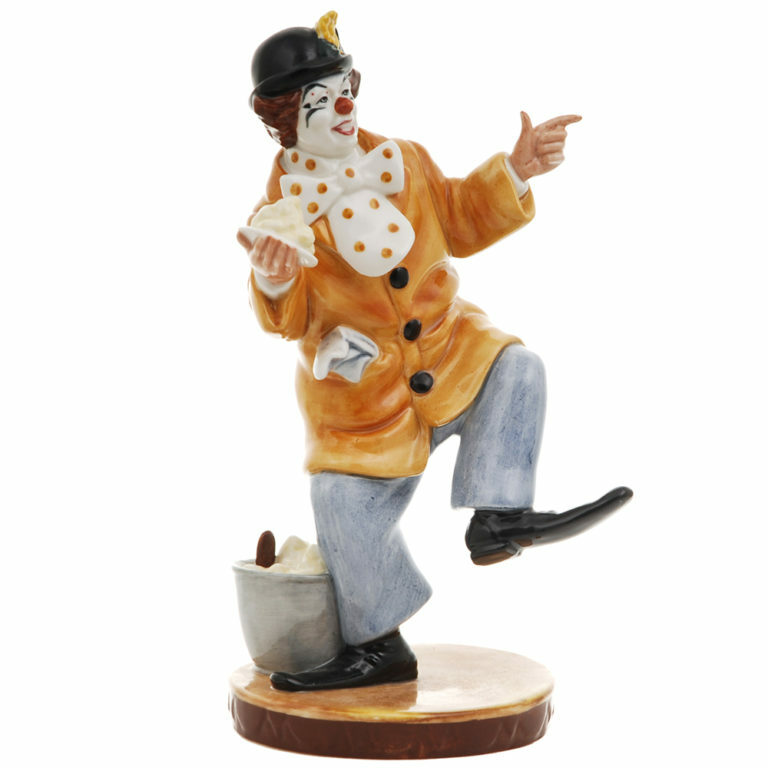 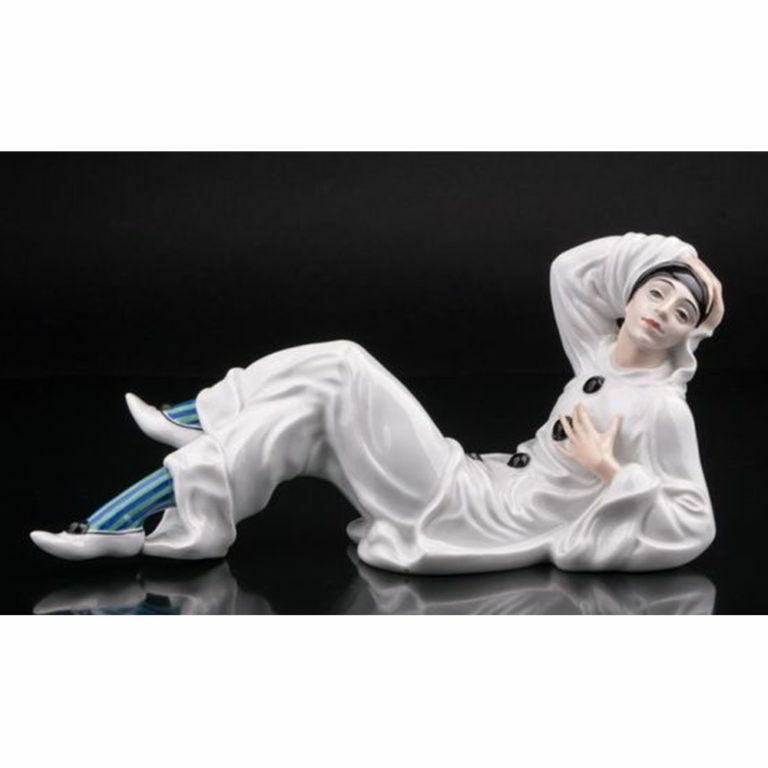 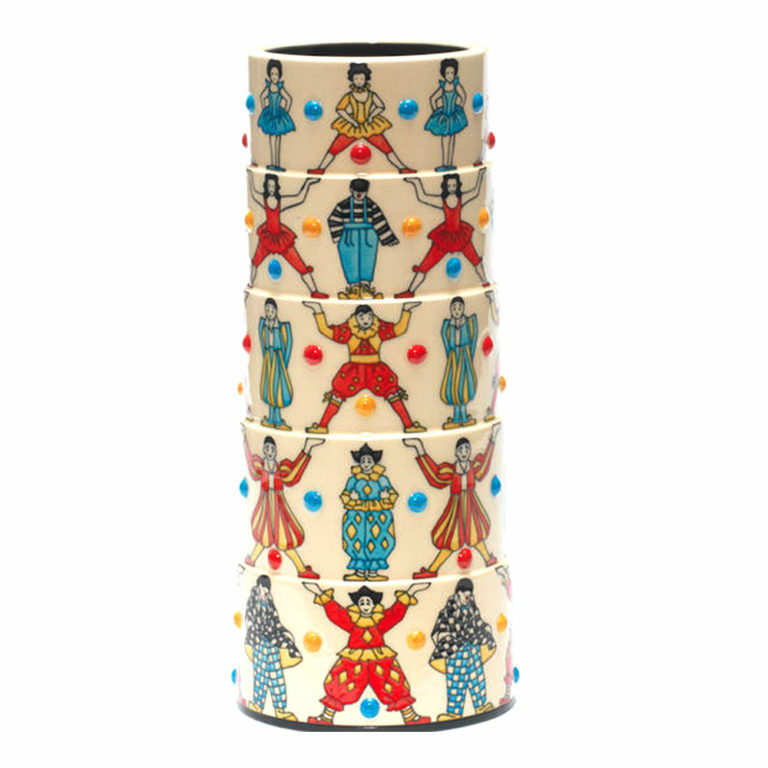 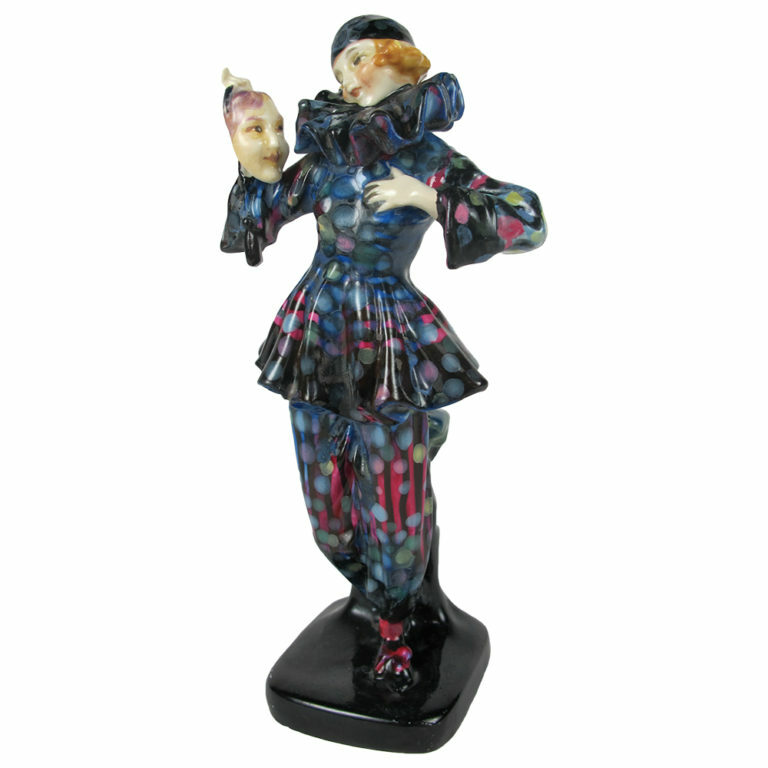 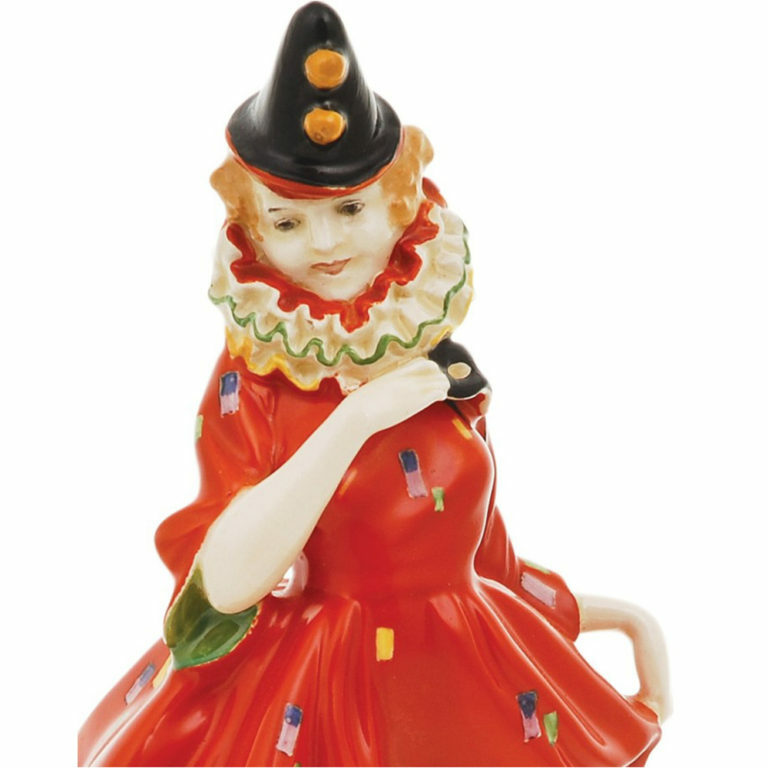 During the Art Deco era, Leslie Harradine produced several Royal Doulton figures of flappers in fancy dress costumes inspired by clowns and jesters and these are particularly sought after by collectors today. 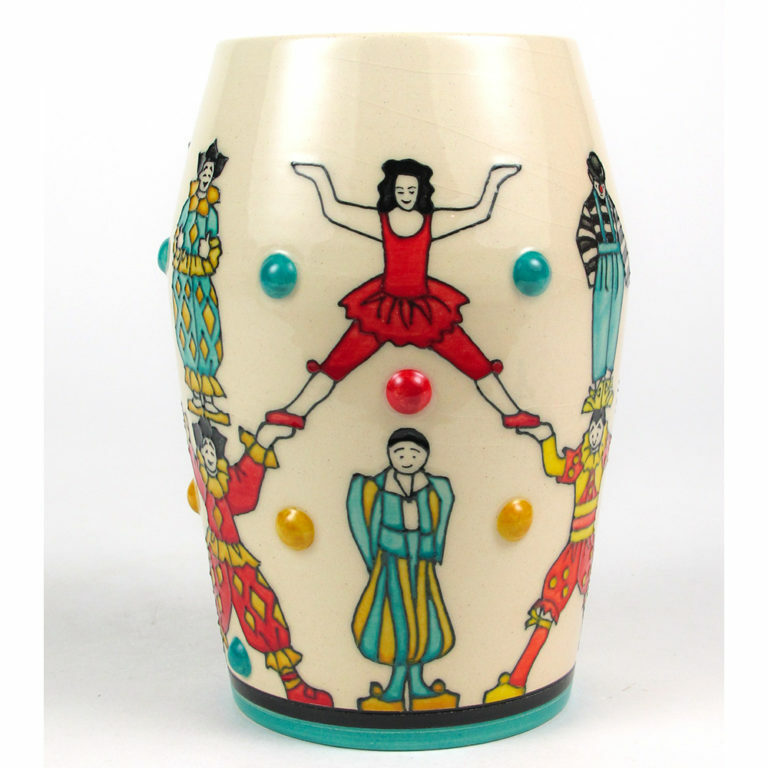 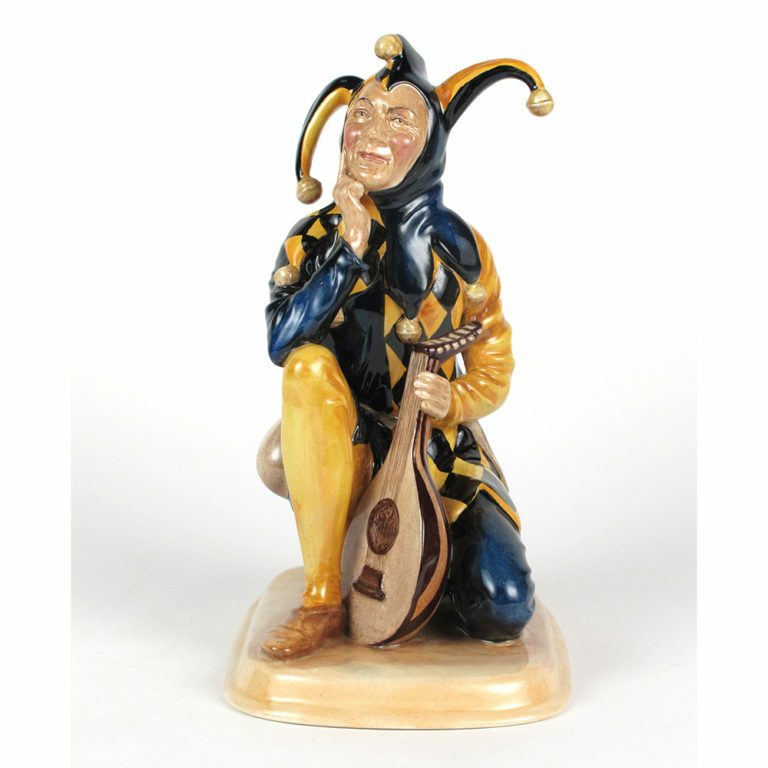 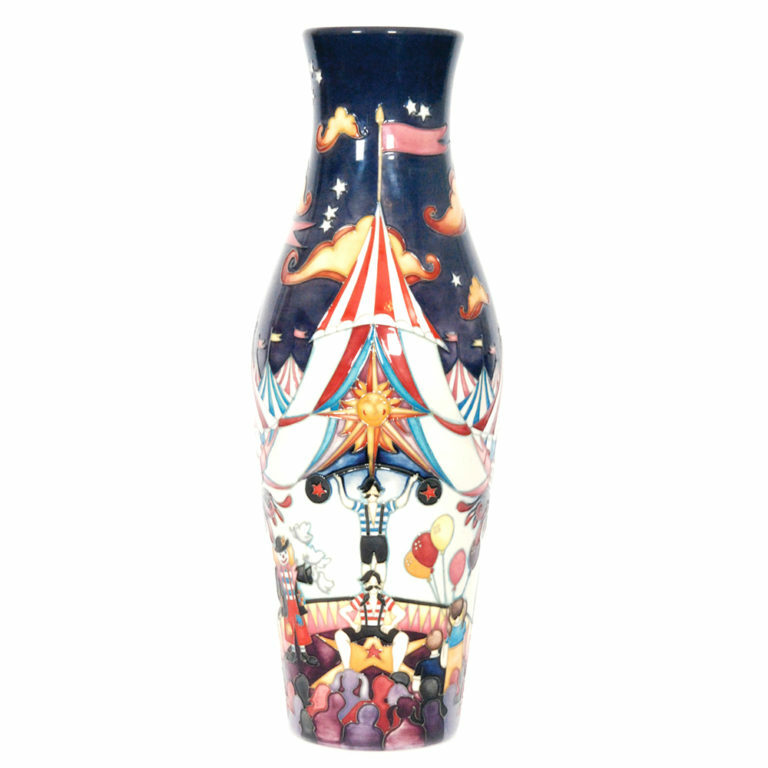 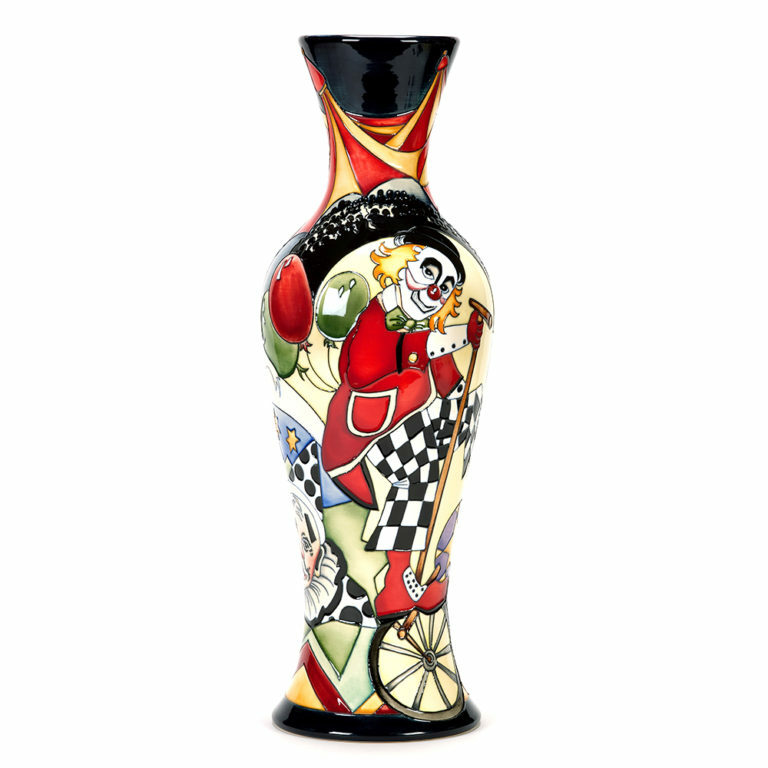 Artists at Moorcroft and the Dennis Chinaworks have also had fun with the antics of clowns on colorful vases. 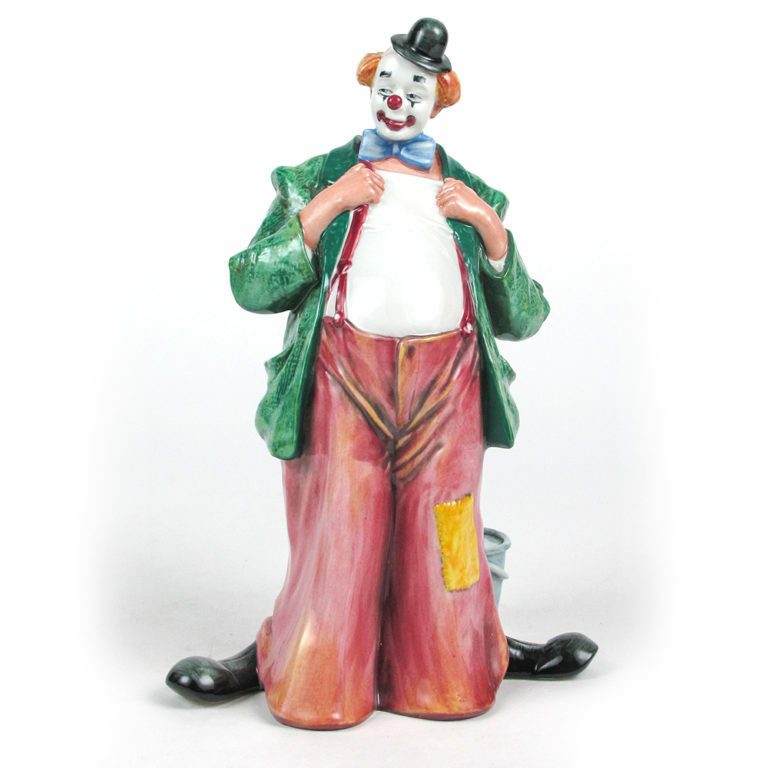 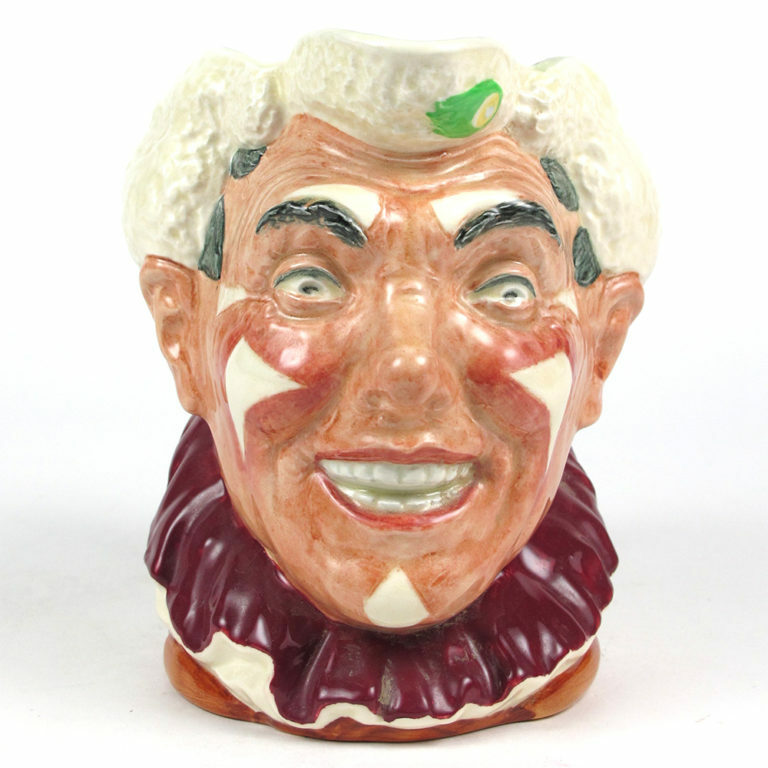 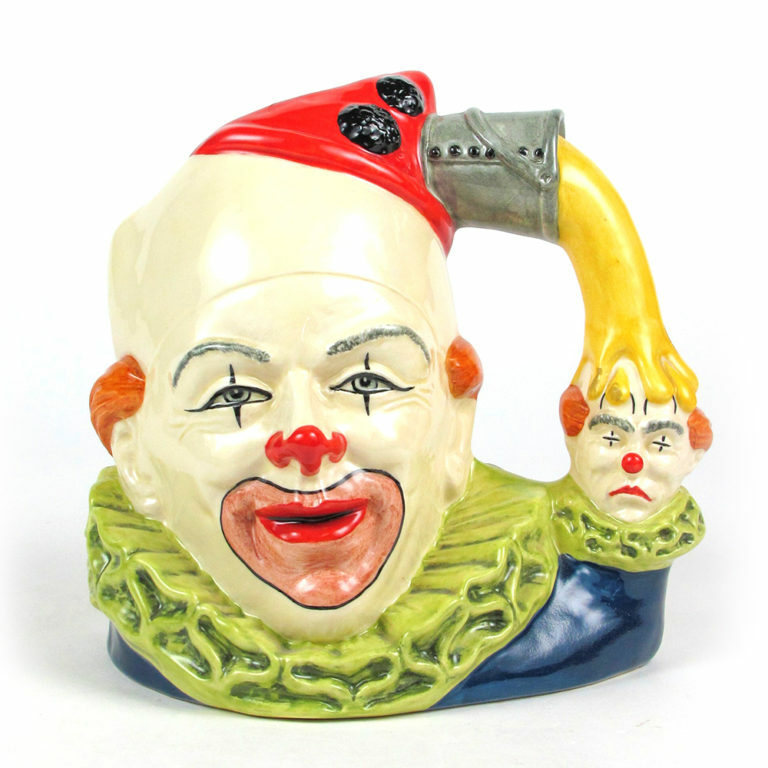 One of America’s most famous clowns was the subject of a prototype Royal Doulton character jug which was never produced. 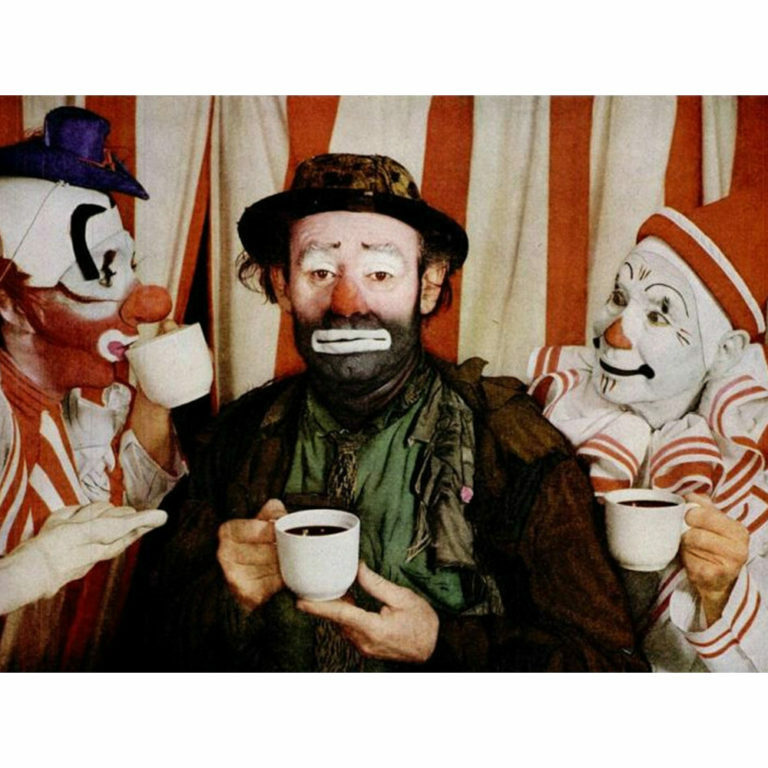 Emmett Kelly began his career as a trapeze artist and began working as a white-faced clown with slapstick stunts full time in 1931. 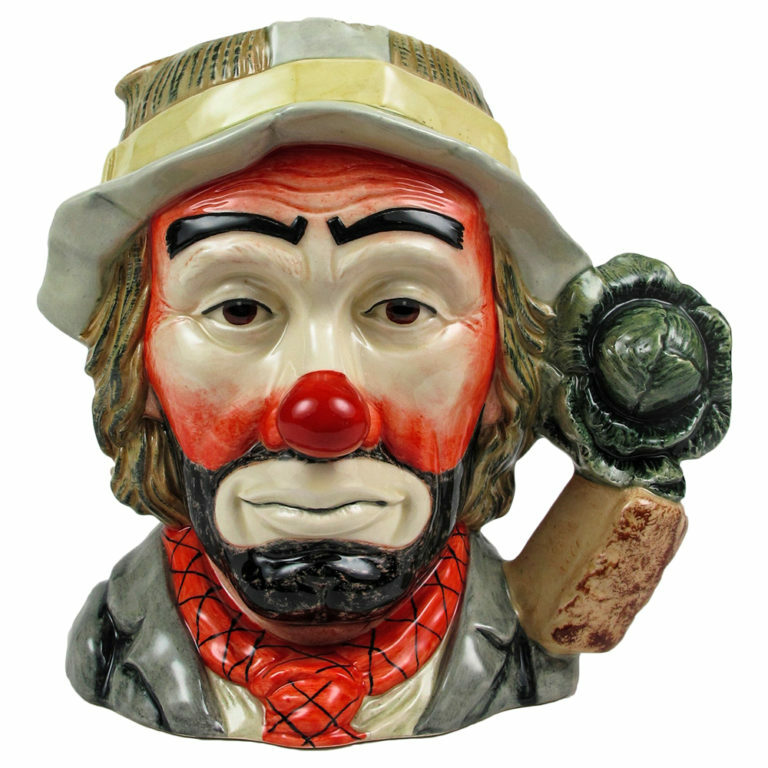 After many years he persuaded the management that he could switch to his revolutionary Weary Willie tramp character who appealed to the sympathy of his audience, rather than just make people laugh. 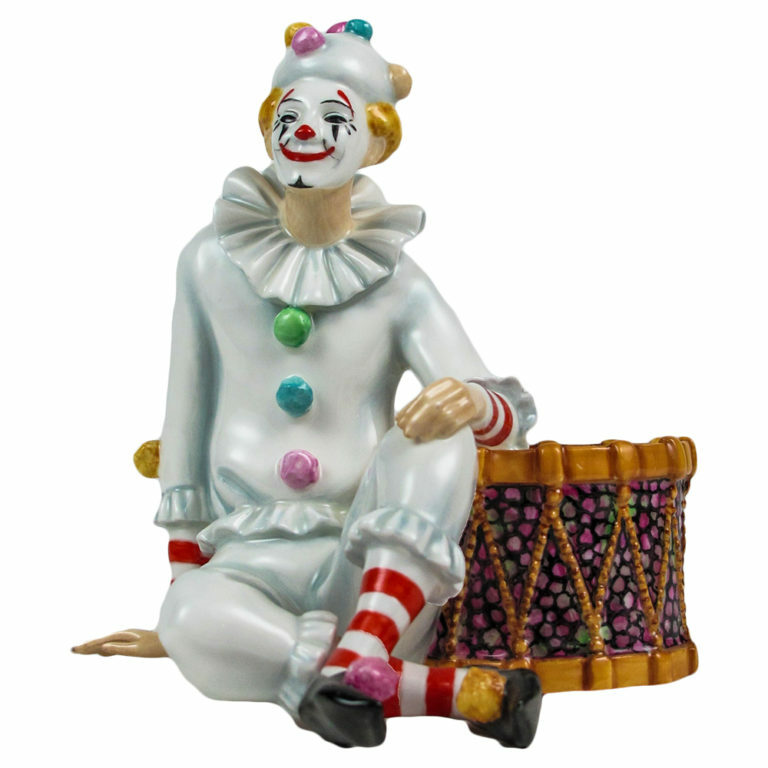 From 1942-1956, Kelly performed with the Ringling Bros and Barnum & Bailey Circus, where he was a major attraction. 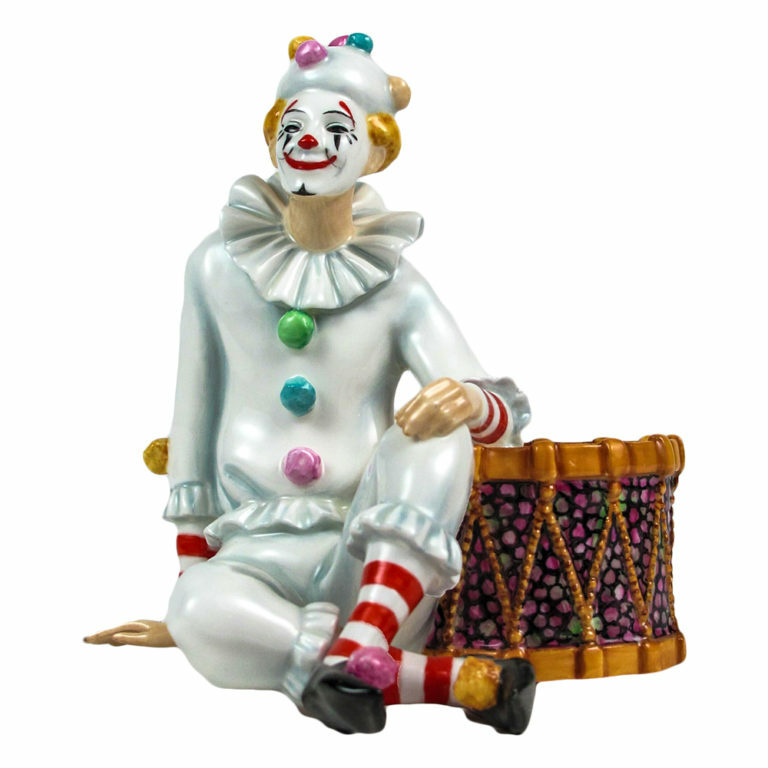 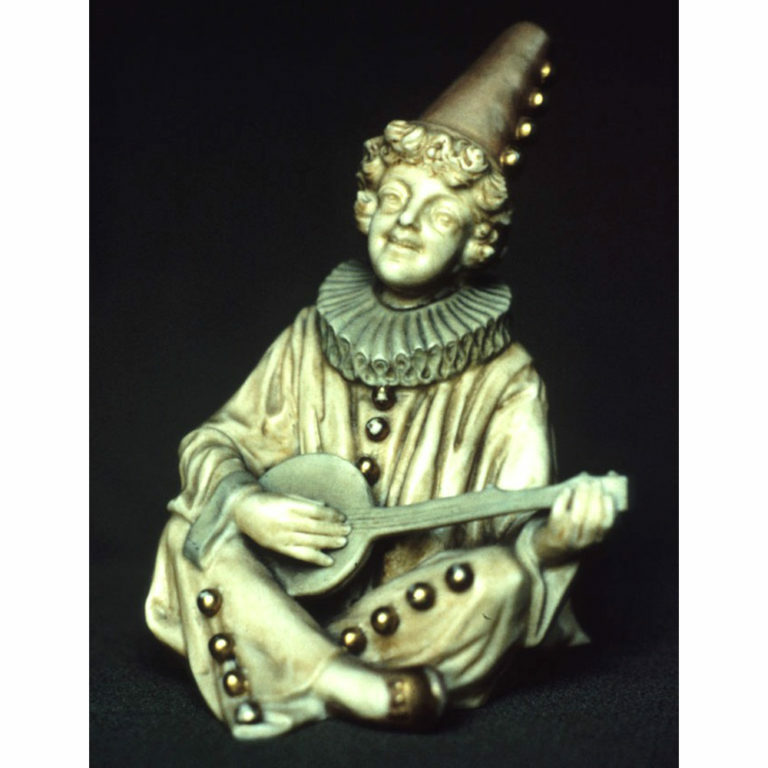 Come see all the colorful clowns by ceramic artists in the Carnival & Cabaret exhibit at WMODA.